SpectraBusters, Inc. is a Georgia nonprofit corporation with board members and other participants in all three states directly affected by the Sabal Trail proposed pipeline: Georgia, Florida, and Alabama. The SpectraBusters board voted Monday March 30th 2015 to send this letter to the court to express our concerns about Sabal Trail’s attempts to claim Georgia eminent domain long before it tried to claim customers in Georgia, as well as possible ill effects throughout the pipeline route, especially in Georgia, if the judge were to rule in this case for application of Georgia eminent domain. Even with Sabal Trail’s claimed agreement with the Metropolitan Gas Authority of Georgia (MGAG), Sabal Trail is still “a long way” from supplying any gas in Georgia, according to MGAG. 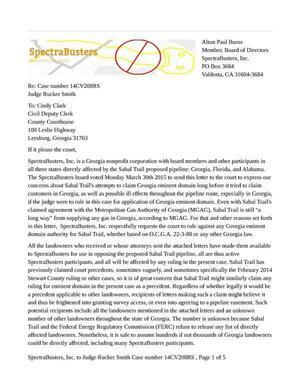 For that and other reasons set forth in this letter, SpectraBusters, Inc. respectfully requests the court to rule against any Georgia eminent domain authority for Sabal Trail, whether based on O.C.G.A. 22-3-88 or any other Georgia law. All the landowners who received or whose attorneys sent the attached letters have made them available to SpectraBusters for use in opposing the proposed Sabal Trail pipeline, all are thus active SpectraBusters participants, and all will be affected by any ruling in the present case. Sabal Trail has previously claimed court precedents, sometimes vaguely, and sometimes specifically the February 2014 Stewart County ruling or other cases, so it is of great concern that Sabal Trail might similarly claim any ruling for eminent domain in the present case as a precedent. Regardless of whether legally it would be a precedent applicable to other landowners, recipients of letters making such a claim might believe it and thus be frightened into granting survey access, or even into agreeing to a pipeline easement. Such potential recipients include all the landowners mentioned in the attached letters and an unknown number of other landowners throughout the state of Georgia. The number is unknown because Sabal Trail and the Federal Energy Regulatory Commission (FERC) refuse to release any list of directly affected landowners. Nonetheless, it is safe to assume hundreds if not thousands of Georgia landowners could be directly affected, including many SpectraBusters participants. Sabal Trail has been sending letters to local landowners threatening use of Georgia eminent domain using O.C.G.A. 22-3-88 since at least the fall of 2013, as evidenced by the attached letters to landowners in Colquitt County, Brooks County, and Lowndes County, listed in the following paragraphs. On 19 November 2014, Colquitt County landowner Sandra Y. Jones filed with FERC under docket PF14-1 and accession number 20141119-5122, in which she included an escalating series of threats she had received in letters from Sabal Trail and its attorneys. 16 September 2013 letter from Kitty Maidens of Sabal Trail claiming O.C.G.A. 22-3-88 gave Sabal Trail rights to access property for surveying. 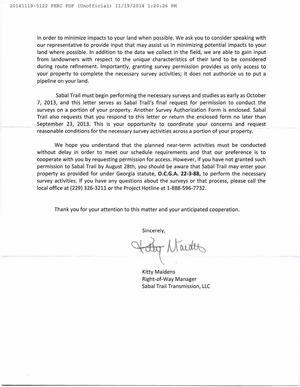 18 October 2013 letter from Kitty Maidens of Sabal Trail claiming those alleged O.C.G.A. 22-3-88 surveying rights "have been affirmed in Georgia courts" and "We are making this final request in an effort to avoid the court process defined in these statutes or any other legal remedies available to the company." 26 November 2013 letter from Matthew J. Calvert of Hutton & Williams LLP in Atlanta claiming to represent Sabal Trail and explicitly threatening the use of O.C.G.A. 22-3-88 eminent domain authority. Lowndes County landowner Larry Rodgers received and had his attorney respond to a threat of application of O.C.G.A. 22-3-88 eminent domain authority. 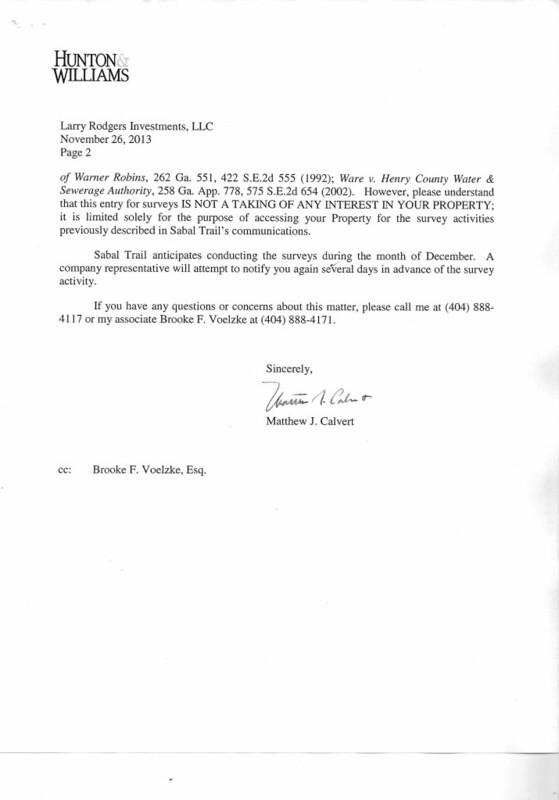 26 November 2013, letter from Matthew J. Calvert of Hutton & Williams LLP, claimed for Sabal Trail "its legal right and need to enter the Property" citing O.C.G.A. 22-3-88 eminent domain authority and citing several court cases which the letter alleged supported that alleged right. 4 December 2013, letter from Bill Langdale of Langdale Vallotton, LLP, attorney for Larry Rodgers Investments, LLC, pointing out that none of the cases cited by Sabal Trail’s attorney pertain to pipeline companies, and pointing out O.C.G.A. 22-3-80 explicitly distinguishes pipelines as special cases. In that regard, our review of the law suggests that one of these “special procedures” requires pipeline companies to obtain a Certificate of Public Convenience and Necessity, pursuant to O.C.G.A. § 22-3-82(c), prior to conducting the type of surveys you describe in your Request. The Langdale letter also cites the notice requirements of O.C.G.A. 22-3-82(a) and the O.C.G.A. 22-3-88 requirement for the pipeline "to actually furnish the natural gas in the State of Georgia as a condition of exercising eminent domain rights in Georgia." The Langdale letter concludes that "any entry on our client’s Property would be an unauthorized entry." 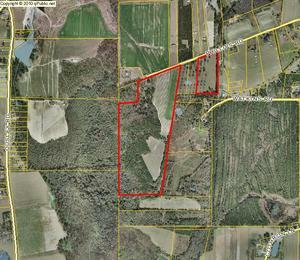 Brooks County landowners Charles H. Harper and Mavis L. Harper received an eminent domain threat from Sabal Trail citing a recent Georgia ruling as an alleged precedent. 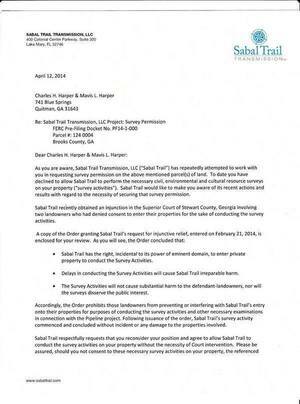 12 April 2014 letter from Kitty Maidens of Sabal Trail citing as precedent for using O.C.G.A. 22-3-88 eminent domain authority, and attaching a copy of, the Stewart County order by Judge W. James Sizemore, Jr. of 20 February 2014 in Case No. 14CV029 of the Superior Court of Stewart County, Georgia. 28. The Project is intended to enhance the reliability of the natural gas transportation network in the southeast, support the needs of other regional power generators and natural gas customers, and address the growing demand for natural gas. None of that has been substantiated, and even if it were true, none of it demonstrates any customers for Sabal Trail in Georgia, which is what O.C.G.A. 22-3-88 seems to require. Sabal Trail in its 21 November 2014 application to FERC in Docket CP15-17 for a construction permit and in various news stories has claimed an agreement to sell natural gas in Georgia through the Metropolitan Gas Authority of Georgia (MGAG). Please note that none of the letters cited above ahat were sent to landowners before November 2014 mentioned any such deal, nor did they mention any other alleged customers of Sabal Trail in Georgia. Thus it would appear that the claims of application of O.C.G.A. 22-3-88 in all those previous letters were devoid of legal legitimacy. Judge Smith may recall Ms. Grover in his courtroom 10 July 2014 at the previous hearing about alleged Sabal Trail trespass after threats of eminent domain. She was interviewed by Wright Gazaway for WALB that same day at the Leesburg courthouse, in a story that aired that evening. Thus it is mysterious how she or Sabal Trail could assert that someone associated with Sabal Trail was not on a landowner’s property without permission, or that Sabal Trail had not threatened eminent domain. Yet she continued to do so in the media. “I would really disagree with any of those accusations,” Grover said. Lisa Connolly, general manager of rates and certificates for Sabal Trail, said that letters sent to property owners should be read in a different light than was presented. “A fair reading of these letters confirms Sabal Trail’s position that it has not threatened to institute proceedings against landowners to acquire property by eminent domain and demonstrates that [Sandra Jones’s] allegations lack any substance,” Connolly wrote to FERC on Monday. As Judge Rucker noted in the hearing in the present case 24 March 2015, it is difficult to see how surveying would not be for the purpose of acquiring property easements. Once again, Judge Rucker may recall Ms. Grover in his courtroom 10 July 2014 as Sabal Trail’s attorneys attempted to get the court to apply the very same O.C.G.A. 22-3-88 used as a threat in all of the above-cited letters from Sabal Trail or its attorneys. Finally, Sabal Trail has not stopped sending letters to landowners threatening eminent domain, as evidenced by one sent to the Cothrons of Lowndes County. Please note a pattern of all these letters threatening O.C.G.A. 22-3-88 Georgia eminent domain of shifting allegations of sometimes vague and sometimes explicit court cases that supposedly support those threats. Is Sabal Trail’s November 2014 claim of MGAG as a Georgia customer a subterfuge to find some way for O.C.G.A. 22-3-88 to apply, as was suggested in the hearing on the present case 24 March 2015? MGAG says it has accepted Sabal Trail’s offer for two taps on their pipeline when it’s built, but say they are a long way away from providing that gas to residents of South Georgia. “Taps do not provide gas in to the state. That would require a meter station in the future, so I’m not an attorney, not involved in Eminent Domain, don’t believe the side taps should have any impact at all on that issue”, says Michael Frey, Chief Operating Officer for MGAG. While the Michael Frey may not be an attorney, presumably as MGAG Chief Operating Officer he does know that Sabal Trail is "a long way away from providing that gas to residents of South Georgia". Which would seem to mean that Sabal Trail is nowhere near meeting the requirements of O.C.G.A. 22-3-88. Yet Sabal Trail has repeatedly sent letters to landowners claiming O.C.G.A. 22-3-88 Georgia eminent domain authority, citing a variety of alleged Georgia court cases. So landowners on the proposed path of Sabal Trail’s pipeline throughout Georgia have every reason to suspect that any ruling in Leesburg for eminent domain would be used by Sabal Trail as a further threat. Georgia landowners also have no reason to care what Sabal Trail finds as "imperative" and every reason to defend their own property against this invader from another state. SpectraBusters, Inc., respectfully asks the court to rule that Sabal Trail did not and does not have any right of Georgia eminent domain under O.C.G.A 22-3-88 or any other Georgia law. Attachments: all the letters cited herein are attached. You can support the work of SpectraBusters by donating today.